Eating tropical fruit such as banana and avocado can ward off heart disease, a new study suggests. Scientists at the University of Alabama at Birmingham, US, have found eating potassium-rich fruit can prevent the hardening and narrowing of the arteries which lead to heart complications and strokes. 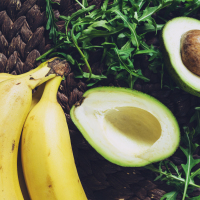 Although the tests have yet to be carried out in humans, a study of mice found a diet low in potassium is more likely to lead to atherosclerosis - the build-up of fatty deposits in your arteries. Researchers monitored mice, that are known to be vulnerable to heart disease when fed a high-fat diet, and varied the levels of potassium in their diets. The mice fed a high-potassium diet maintained healthy arteries. Comparatively, those with reduced potassium in their diets experienced vascular calcification, or hardening. Paul Sanders, research professor at the University of Alabama, said: "The findings have important translational potential since they demonstrate the benefit of adequate potassium supplementation on prevention of vascular calcification in atherosclerosis-prone mice, and the adverse effect of low potassium intake." According to the charity Heart UK, coronary heart disease (CHD) is the single most common cause of death in Europe for people under the age of 65. Statistics compiled by the charity show over 1.6 million men and over a million women are living with CHD in Britain, and a heart attack happens every seven minutes on average. Anyone with heart disease or other pre-existing heart conditions can still enjoy holidays and overseas trips with peace of mind by taking out pre-existing medical travel insurance.